Exploration drilling gives a geologist access to the subsurface geology through borehole cuttings and coring, geophysical logging, and physical testing within the borehole. Wells provide a means to access & extract precious natural resources, such as groundwater, oil, and gas. Wells also provide a means to injection and withdrawal energy resources. Exploratory well drilling and construction of water supply and energy storage wells are an integral part of Hydrodynamics clients’ projects. The success of our project drilling programs is the result of selecting the right drilling methodology and geological rock sampling to collect the geologic data needed for our projects. It is also successful because our selection of the right drilling contractor by preparing competitive bidding documents for our clients. Another key element to our success is the substantial experience of each of our well site geologists in well construction and supervision, and geological well sample collection and analysis. Hydrodynamics has working relationships with some of the major well drilling companies in the United States. Hydrodynamics designed and implemented the Dallas Center monitoring well drilling program since 2002. We designed and constructed three monitoring wells to over 3,000 feet in depth. The wells involved the large diameter core drilling and sampling for geological logging and laboratory analysis. We developed a complex geophysical wellbore-logging program. All wells were hydraulically pump tested with water quality sampling. Since 1997, Hydrodynamics’ YM exploratory drilling program involved the drilling of two cored monitoring wells to depths of over 4,800 feet and core drilled a 2,000-foot depth monitoring well through an active fault. We supervised the recompletion of a 3,000-foot depth monitoring well. Hydrodynamics also provided well site support for the drilling of seven shallower monitoring wells from 200 to 1,300 feet in depth under artesian conditions. 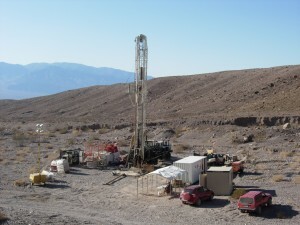 Our well site geologists have logged over 1,000 feet of core samples, and documented well construction. We specified and supervised geophysical logging of all wells. We also designed and performed numerous 72-hour pumping tests. Principal Michael King has owned a successful drilling company. We routinely drill exploration core wells to over 3,000-foot depths. 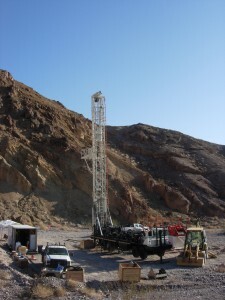 Our well site geologists each have over 20 years of experience. We work closely with major drilling contractors to prepare well bidding documents. We have solved complex drilling problems like lost circulation conditions.